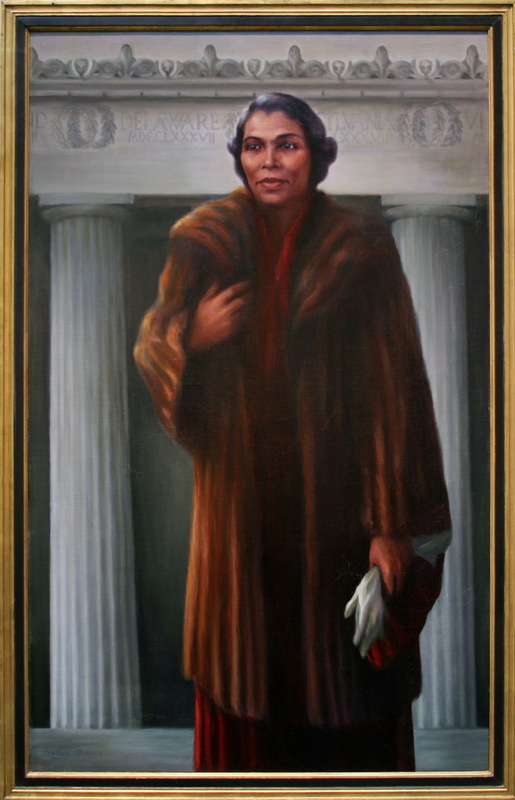 Depicted here by Betsy Graves Reyneau is Marian Anderson, a woman who fought the devil with the voice of an angel. It was said by the conductor, Arturo Toscanini that a singing voice like Marian Anderson’s only “comes around once in a hundred years.” And it just so happened that this voice came around right when the world needed it most of all. Marian Anderson was born on February 27, 1897 to John Berkley Anderson and Annie Delilah Rucker, a coal and ice dealer and a Virginia schoolteacher respectively. They couldn’t afford to enroll Marian in voice lessons, or school for that matter, but little Marion, the daughter of two devout Christians, began singing in the church choir at the age of six. The money situation only got worse when Anderson’s father died when she was 12 years old but Anderson’s musical ambitions, which her father encouraged, were undeterred. She could sing every part (soprano, alto, tenor, and bass) of the hymns that the choir sang and pretty much made everyone who heard her weep like a little baby. Eventually, the choir pulled enough money together to pay for Anderson to both go to high school and to get private singing lessons from Giuseppe Boghetti, a respected voice coach who was no exception to the weeping like a baby effect of Marian Anderson. When she graduated from high school, Marian applied for the Philadelphia Music Academy but was denied because she was Black. She kept at it though and entered the New York Philharmonic singing competition. Unsurprisingly to anyone who wasn’t deaf, Marian won the competition and the opportunity to sing in concert with the orchestra. This was Anderson’s “big break” as they say. She gained great acclaim but racist America still couldn’t decide whether they liked her or not. She did concert after concert in America but afterwards restaurants and hotels would turn her away for being Black, despite the fact that by this point she was an international celebrity. On one occasion in Princeton, New Jersey, Marian Anderson was denied lodging and none other than Albert Einstein offered his home to her. This was the first of many times that she would stay with him. On another occasion in 1939, Anderson’s manager tried to secure her a spot singing at the Constitution Hall. Unfortunately this venue was owned by the Daughters of the American Revolution, who wouldn’t allow a Black person to perform on their stage. This was met with great criticism but the D.A.R. didn’t change their mind, even when Eleanor Roosevelt resigned from the organization saying, "I am in complete disagreement with the attitude taken in refusing Constitution Hall to a great artist...You had an opportunity to lead in an enlightened way and it seems to me that your organization has failed." So instead of performing at Constitution Hall, which she eventually did anyway, Anderson performed at the Lincoln Memorial, a much more powerful venue, what with the massive statue of Abraham Lincoln behind her as she made 75,000 people in the audience and millions of people listening via radio weep at once. In one 25 minute concert, Anderson facilitated a turning point in the civil rights movement. Anderson was awarded the Presidential Medal of Freedom, the Eleanor Roosevelt Human Rights Award, the National Arts Medal, and a Grammy Award for Lifetime Achievement, but honestly? She deserved so much more. "Marian Anderson." Biography. N.p., 2018. Web. 13 Aug. 2018. "Marian Anderson: Musical Icon | American Experience | PBS." Pbs.org. N.p., 2018. Web. 13 Aug. 2018. "Marian Anderson | National Portrait Gallery." Npg.si.edu. N.p., 2018. Web. 13 Aug. 2018. Kozinn, Allan. "Marian Anderson Is Dead At 96; Singer Shattered Racial Barriers." Nytimes.com. N.p., 1993. Web. 13 Aug. 2018. Stamberg, Susan. "Denied A Stage, She Sang For A Nation." Npr.org. N.p., 2014. Web. 13 Aug. 2018.